Define the factors that create social groups and perceptions of entitativity. Define the concept of social identity, and explain how it applies to social groups. Review the stages of group development and dissolution. Although it might seem that we could easily recognize a social group when we come across one, it is actually not that easy to define what makes a group of people a social group. Imagine, for instance, a half dozen people waiting in a checkout line at a supermarket. You would probably agree that this set of individuals should not be considered a social group because the people are not meaningfully related to each other. And the individuals watching a movie at a theater or those attending a large lecture class might also be considered simply as individuals who are in the same place at the same time but who are not connected as a social group. Of course, a group of individuals who are currently in the same place may nevertheless easily turn into a social group if something happens that brings them “together.” For instance, if a man in the checkout line of the supermarket suddenly collapsed on the floor, it is likely that the others around him would begin to work together to help him. Someone would call an ambulance, another might give CPR, and another might attempt to contact his family. Similarly, if the movie theater were to catch on fire, a group would form as the individuals attempted to leave the theater. And even the class of students might come to feel like a group if the instructor continually praised it for being the best (or worst) class that he or she has ever had. It has been a challenge to characterize what the “something” is that makes a group a group, but one term that has been used is entitativity (Campbell, 1958; Lickel et al., 2000). Entitativity refers to something like “groupiness”—the perception, either by the group members themselves or by others, that the people together are a group. The concept of entitativity is an important one, both in relation to how we view our ingroups, and also in terms of our perceptions of and behavior toward our outgroups. For example, strong perceptions of ingroup entitativity can help people to retain their sense of collective self-esteem in the face of difficult circumstances (Bougie, Usborne, de la Sablonniere, & Taylor, 2011). Seeing our ingroups as more entitative can also help us to achieve our individual psychological needs (Crawford & Salaman, 2012). With our outgroups, our perceptions of their entitativity can influence both our prosocial and antisocial behaviors toward them. For instance, although in some situations individuals may feel more xenophobic toward outgroups that they perceive as more entitative (Ommundsen, van der Veer, Yakushko, & Ulleberg, 2013), they may in other contexts choose to donate more money to help more entitative outgroups (Smith, Faro, & Burson, 2013). One determinant of entitativity is a cognitive one—the perception of similarity. As we saw in our discussions of liking and loving, similarity is important across many dimensions, including beliefs, values, and traits. A group can only be a group to the extent that its members have something in common; at minimum, they are similar because they all belong to the group. If a collection of people are interested in the same things, share the same opinions and beliefs, or work together on the same task, then it seems they should be considered—by both themselves and others—to be a group. However, if there are a lot of differences among the individuals, particularly in their goals, values, beliefs, and behaviors, then they are less likely to be seen as a group. Given the many differences that we have discussed in other chapters between members of individualistic and collectivistic cultures in terms of how they see their social worlds, it should come as no surprise that different types of similarity relate more strongly to perceptions of entitativity in each type of culture. For instance, similarity in terms of personal traits has been found to be more strongly associated with entiativity in American versus Japanese participants, with the opposite pattern found for similarity in terms of common goals and outcomes (Kurebayashi, Hoffman, Ryan, & Murayama, 2012). People, then, generally get together to form groups precisely because they are similar. For example, perhaps they are all interested in playing poker, or follow the same soccer team, or like martial arts. And groups are more likely to fall apart when the group members become dissimilar and thus no longer have enough in common to keep them together (Crump, Hamilton, Sherman, Lickel, & Thakkar, 2010; Miles & Kivlighan, 2008). Although similarity is important, it is not the only factor that creates a group. Groups have more entitativity when the group members have frequent interaction and communication with each other (Johnson & Johnson, 2012). Although communication can occur in groups that meet together in a single place, it can also occur among individuals who are at great distances from each other. The members of a research team who communicate regularly via Skype, for instance, might have frequent interactions and feel as if they are a group even though they never or rarely meet in person. Interaction is particularly important when it is accompanied by interdependence—the extent to which the group members are mutually dependent upon each other to reach a goal. In some cases, and particularly in working groups, interdependence involves the need to work together to successfully accomplish a task. Individuals playing baseball are dependent upon each other to be able to play the game and also to play well. Each individual must do his or her job in order for the group to function. We are also interdependent when we work together to write a research article or create a class project. When group members are interdependent, they report liking each other more, tend to cooperate and communicate with each other to a greater extent, and may be more productive (Deutsch, 1949). Still another aspect of working groups whose members spend some time working together and that makes them seem “groupy” is that they develop group structure—the stable norms and roles that define the appropriate behaviors for the group as a whole and for each of the members. The relevant social norms for groups include customs, traditions, standards, and rules, as well as the general values of the group. Particularly important here are injunctive norms, which specify how group members are expected to behave. Some of these are prescriptive norms, which tell the group members what to do, whereas some are proscriptive norms, which tell them what not to do. In general, the more clearly defined and the widely agreed upon the norms in a group are, the more entitativity that the group members will feel. Effective groups also develop and assign social roles (the expected behaviors) to group members. For instance, some groups may be structured such that they have a president, a secretary, and many different working committees. Different roles often come with different levels of status, or perceived power, and these hierarchies. In general, groups are more effective when the roles assigned to each member are clearly defined and appropriate to those individuals’ skills and goals. Also, if members have more than one role, for example, player and coach, it is important that these roles are compatible rather than contradictory. High-performing groups are thus able to avoid placing members under role stress. This occurs when individuals experience incompatible demands and expectations within or between the roles that they occupy, which often negatively impacts their ability to be successful in those roles (Forsyth, 2010). Although cognitive factors such as perceived similarity, communication, interdependence, and structure are often important parts of what we mean by being a group, they do not seem to always be necessary. In some situations, groups may be seen as groups even if they have little independence, communication, or structure. Partly because of this difficulty, an alternative approach to thinking about groups, and one that has been very important in social psychology, makes use of the affective feelings that we have toward the groups that we belong to. As we have read, social identity refers to the part of the self-concept that results from our membership in social groups (Hogg, 2003). Generally, because we prefer to remain in groups that we feel good about, the outcome of group membership is a positive social identity—our group memberships make us feel good about ourselves. According to the social identity approach, a group is a group when the members experience social identity—when they define themselves in part by the group that they belong to and feel good about their group membership (Hogg, 2010). This identity might be seen as a tendency on the part of the individual to talk positively about the group to others, a general enjoyment of being part of the group, and a feeling of pride that comes from group membership. Because identity is such an important part of group membership, we may attempt to create it to make ourselves feel good, both about our group and about ourselves. Perhaps you know some people—maybe you are one—who wear the clothes of their sports team to highlight their identity with the group because they want to be part of, and accepted by, the other group members. Indeed, the more that we see our social identities as part of our membership of a group, the more likely we are to remain in them, even when attractive alternatives exist (Van Vugt & Hart, 2004). Although many groups are basically static, performing the same types of tasks day in and day out, other groups are more dynamic. In fact, in almost all groups there is at least some change; members come and go, and the goals of the group may change. And even groups that have remained relatively stable for long periods of time may suddenly make dramatic changes; for instance, when they face a crisis, such as a change in task goals or the loss of a leader. Groups may also lose their meaning and identity as they successfully meet the goals they initially set out to accomplish. One way to understand group development is to consider the potential stages that groups generally go through. One widely used approach here is the model developed by Tuckman and Jensen (1977). 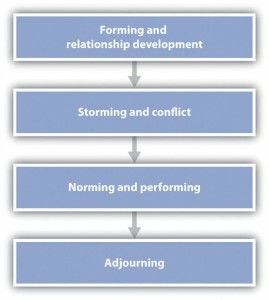 As you can see in Figure 10.1.2, “Stages of Group Development,” the different stages involve forming, storming, norming and performing, and adjourning. The forming stage occurs when the members of the group come together and begin their existence as a group. In some cases, when a new group, such as a courtroom jury, forms to accomplish a goal, the formation stage occurs relatively quickly and is appropriately considered the group’s first stage. In other cases, however, the process of group formation occurs continually over a long period of time, such as when factory workers leave their jobs and are replaced by new employees. The forming stage is important for the new members, as well as for the group itself. During this time, the group and the individual will exchange knowledge about appropriate norms, including any existing group structures, procedures, and routines. Each individual will need to learn about the group and determine how he or she is going to fit in. And the group may be inspecting the individual’s characteristics and appropriateness as a group member. This initial investigation process may end up with the individual rejecting the group or the group rejecting the individual. If the forming stage can be compared to childhood, there is no doubt that the next stage—storming—can be compared to adolescence. As the group members begin to get to know each other, they may find that they don’t always agree on everything. In the storming stage, members may attempt to make their own views known, expressing their independence and attempting to persuade the group to accept their ideas. Storming may occur as the group first gets started, and it may recur at any point during the group’s development, particularly if the group experiences stress caused by a negative event, such as a setback in progress toward the group goal. In some cases, the conflict may be so strong that the group members decide that the group is not working at all and they disband. In fact, field studies of real working groups have shown that a large percentage of new groups never get past the forming and storming stages before breaking up (Kuypers, Davies, & Hazewinkel, 1986). Although storming can be harmful to group functioning and thus groups must work to keep it from escalating, some conflict among group members may in fact be helpful. Sometimes the most successful groups are those that have successfully passed through a storming stage, because conflict may increase the productivity of the group, unless the conflict becomes so extreme that the group disbands prematurely (Rispens & Jehn, 2011). Groups that experience no conflict at all may be unproductive because the members are bored, uninvolved, and unmotivated, and because they do not think creatively or openly about the topics of relevance to them (Tjosvold, 1991). In order to progress, the group needs to develop new ideas and approaches, and this requires that the members discuss their different opinions about the decisions that the group needs to make. Assuming that the storming does not escalate too far, the group will move into the norming stage, which is when the appropriate norms and roles for the group are developed. Once these norms have been developed, they allow the group to enter the performing stage, which is when group members establish a routine and effectively work together. At this stage, the individual group members may report great satisfaction and identification with the group, as well as strong group identity. Groups that have effectively reached this stage have the ability to meet goals and survive challenges. And at this point, the group becomes well tuned to its task and is able to perform the task efficiently. In one interesting observational study of the group development process in real groups, Gersick (1988, 1989) observed a number of teams as they worked on different projects. The teams were selected so that they were all working within a specific time frame, but the time frame itself varied dramatically—from eight to 25 meetings held over periods ranging from 11 days to six months. Despite this variability, Gersick found that each of the teams followed a very similar pattern of norming and then performing. In each case, the team established well-defined norms regarding its method of attacking its task in its very first meeting. And each team stayed with this approach, with very little deviation, during the first half of the time it had been allotted. However, midway through the time it had been given to complete the project (and regardless of whether that was after four meetings or after 12), the group suddenly had a meeting in which it decided to change its approach. Then, each of the groups used this new method of performing the task during the rest of its allotted time. It was as if an alarm clock went off at the halfway point, which led each group to rethink its approach. Most groups eventually come to the adjourning stage, where group members prepare for the group to end. In some cases, this is because the task for which the group was formed has been completed, whereas in other cases it occurs because the group members have developed new interests outside the group. In any case, because people who have worked in a group have likely developed a strong identification with the group and the other group members, the adjournment phase is frequently stressful, and participants may resist the breakup. Faced with these situations, individuals frequently plan to get together again in the future, exchanging addresses and phone numbers, even though they may well know that it is unlikely they will actually do so. Sometimes it is useful for the group to work ahead of time to prepare members for the breakup. Keep in mind that this model represents only a general account of the phases of group development, beginning with forming and ending with adjourning, and will not apply equally well to all groups . For instance, the stages are not necessarily sequential: some groups may cycle back and forth between earlier and later stages in response to the situations they face. Also, not all groups will necessarily pass through all stages. Nevertheless, the model has been useful in describing the evolution of a wide range of groups (Johnson & Johnson, 2012). Social groups form the foundation of human society—without groups, there would be no human culture. Working together in groups, however, may lead to a variety of negative outcomes as well. Similarity, communication, interdependence, and group structure are variables that make a collection of individuals seem more like a group—the perception of group entitativity. Most groups that we belong to provide us with a positive social identity—the part of the self-concept that results from our membership in social groups. The more we feel that our identities are tied to the our group memberships, the less likely we are to leave the groups we belong to. One way to understand group development is to consider the potential stages that groups generally go through. The normal stages are forming, storming, norming and performing, and adjourning. Compare some of the social groups that you belong to that you feel have high and low levels of entitativity. How do these groups differ in terms of their perceived similarity, communication, interdependence, and structure? Describe a situation where you experienced role stress. What were the causes of that stress and how did it affect your performance in that role? Think about a group that you belong to now, which is very important to you. Identify one prescriptive and one proscriptive norm for this group. How do you think that these norms help the group to function effectively? What do you think would happen if a group member violated those norms? Consider groups that provide a particularly strong social identity for their members. Why do you think social identity is so strong in these groups, and how do you think that the experience of identity influence the group members’ behavior? Think about a group that you have been a member of for a long time. Which of Tuckman and Jensen’s stages do you think that the group is currently in? Overall, how well do you think that their stage model helps to explain how this group has developed over time? Bougie, E., Usborne, E., de la Sablonnière, R., & Taylor, D. M. (2011). The cultural narratives of Francophone and Anglophones Quebecers: Using a historical perspective to explore the relationships among collective relative deprivation, in‐group entitativity, and collective esteem. British Journal Of Social Psychology,50 (4), 726-746. Campbell, D. T. (1958). Common fate, similarity, and other indices of the status of aggregate persons as social entities. Behavioral Science, 3, 14-25. Crawford, M. T., & Salaman, L. (2012). Entitativity, identity, and the fulfilment of psychological needs. Journal Of Experimental Social Psychology,48 (3), 726-730. Crump, S. A., Hamilton, D. L., Sherman, S. J., Lickel, B., & Thakkar, V. (2010). Group entitativity and similarity: Their differing patterns in perceptions of groups. European Journal of Social Psychology, 40(7), 1212–1230. doi: 10.1002/ejsp.716. Deutsch, M. (1949). An experimental study of the effects of cooperation and competition upon group processes. Human Relations, 2, 199–231. Forsyth, D. (2010). Group dynamics (5th ed.). Belmont, CA: Wadsworth. Gersick, C. J. (1988). Time and transition in work teams: Toward a new model of group development. Academy of Management Journal, 31(1), 9–41. Gersick, C. J. (1989). Marking time: Predictable transitions in task groups. Academy of Management Journal, 32, 274–309. Hogg, M. A. (2003). Social identity. In M. R. Leary & J. P. Tangney (Eds. ), Handbook of self and identity (pp. 462–479). New York, NY: Guilford Press. Hogg, M. A. (2010). Human groups, social categories, and collective self: Social identity and the management of self-uncertainty. In R. M. Arkin, K. C. Oleson, & P. J. Carroll (Eds. ), Handbook of the uncertain self (pp. 401–420). New York, NY: Psychology Press. Johnson, D.W., & Johnson, F.P. (2012). Joining Together – Group Theory and Group Skills (11th ed). Boston: Allyn and Bacon. Kurebayashi, K., Hoffman, L., Ryan, C. S., & Murayama, A. (2012). Japanese and American perceptions of group entitativity and autonomy: A multilevel analysis. Journal Of Cross-Cultural Psychology,43(2), 349-364. Kuypers, B. C., Davies, D., & Hazewinkel, A. (1986). Developmental patterns in self-analytic groups. Human Relations, 39(9), 793–815. Lickel, B., Hamilton, D. L., Wieczorkowska, G., Lewis, A., Sherman, S. J., & Uhles, A. N. (2000). Varieties of groups and the perception of group entitativity. Journal of Personality and Social Psychology, 78(2), 223–246. Ommundsen R, van der Veer K, Yakushko O, Ulleberg P. Exploring the relationships between fear-related xenophobia, perceptions of out-group entitativity, and social contact in Norway. Psychological Reports [serial online]. February 2013;112(1):109-124. Smith, R. W., Faro, D., & Burson, K. A. (2013). More for the many: The influence of entitativity on charitable giving. Journal Of Consumer Research, 39(5), 961-975. Tjosvold, D. (1991). The conflict-positive organization. Reading, MA: Addison-Wesley. Tuckman, B., & Jenson, M. (1977). Stages of small group development revisited. Group and Organizational Studies, 2, 419-427. Van Vugt, M., & Hart, C. M. (2004). Social identities as glue: The origins of group loyalty. Journal of Personality and Social Psychology, 86, 585-598.